Thomas Ewing, Jr. (1829-1896) – Military Officer, Free-State advocate and first Chief Justice of the State of Kansas, Ewing was born at Lancaster, Ohio on August 7, 1829. Ewing was educated in public schools and when only 19 years-old was appointed Secretary of the Commission to settle the boundary between Ohio and Virginia. He also served as private secretary to President Zachary Taylor during his administration. After the president’s death, he entered Brown University, where he graduated in 1854. A year later he received his degree from the Cincinnati Law School and was admitted to the bar. In 1856, married Ellen E. Cox of Piqua, Ohio and the pair would have five children. That same year, in November, he moved to Leavenworth, Kansas, where he became a member of the law firm of Sherman, Ewing & McCook. He soon took a place at the head of his profession and played a conspicuous part in the great political struggle of the territorial era as a Free-State man. When the abolitionist men met in convention in December, 1857 to decide whether the opponents of slavery in the territory should take part in the election of January 4, 1858, Ewing urged that they vote. This motion was defeated and with twelve others, Ewing retired. They then organized and nominated men for all the offices, each candidate being pledged to vote for a new Constitution that should forever prohibit slavery in Kansas. Ten days before the election, Ewing and his twelve associates started to canvas the territory. The Surveyor-General, John Calhoun, whose duty it was to await the election returns, tried to defeat the Free-State party by declaring the pro-slavery men had won, and went so far as to start for Washington to submit the Lecompton Constitution to Congress for the purpose of having Kansas admitted as a slave state. Ewing was able to get the Free-State Territorial Legislature to appoint a committee, of which he was the head, to investigate the election returns. At the election for state officers on December 6, 1859, the first held under the Wyandotte Constitution, Ewing was elected Chief Justice for a term of six years and took his seat on the bench in February, 1861 when the state government was established. In the summer of 1862 he aided in recruiting the Eleventh Kansas Infantry. He was appointed colonel on September 14th and soon after resigned as Chief Justice to take command of the regiment. He took part in the actions of Cane Hill, Van Buren and Prairie Grove, and on March 13, 1863, was commissioned Brigadier-General of Volunteers by President Abraham Lincoln, for “gallant and meritorious services.” Until June, 1863, he commanded the First Division of the Army of the Frontier, under Major-General Herron. The division was then discontinued and General Ewing was assigned to the command of the District of the Border, comprising all of Kansas north of the 38th parallel and of the western tier of counties in Missouri north of that line. His command was kept actively at work in repelling guerrilla raids. Ewing found that such men as William Quantrill and Richard Yeager had an impregnable base of operations in the three border counties of Missouri, with spies scattered throughout the country. After Quantrill’s raid of Lawrence, Kansas in August, 1863, he issued “General Order No. 11,” a severe but necessary measure which effectually cleared the border of a population supporting the guerrillas. The order was sustained by the general government, but in the Democratic National Convention, which met in New York City on July 6, 1868, he was defeated for nomination for Vice President because of this order. 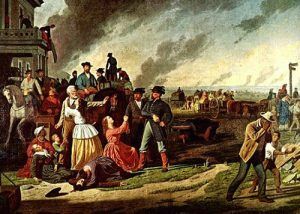 The assaults made upon him by his political enemies in Kansas and Missouri, caused General Ewing to ask for a Court of Inquiry, but the president refused to order it and at the same time, enlarged the district under the general’s command. In February, 1864 when the District of the Border was divided by the erection of Kansas as a department, General Ewing relieved General Fish of the command of southeastern Missouri with headquarters at St. Louis. In the fall of 1864, he was actively engaged against General Price, who invaded Missouri. On February 23. 1865, General Ewing resigned his command and on March 13th, was breveted as a Major-General. by George Caleb Bingham, 1870. At the close of the Civil War, he resumed his law practice in Washington, but returned to his native state of Ohio in 1870. In 1873 he was a member of the Ohio Constitutional Convention and served in Congress from 1877 to 1881. He opposed the rise of Federal troops at state elections, favored the re-monetization of silver, and was one of the leaders of the movement to preserve the greenback currency. In 1879, he was the Democratic candidate for governor of Ohio. Three years later he moved to New York City and entered into partnership with Southard & Fairchild, subsequently the firm became Ewing, Whitman & Ewing. He was the founder of the Ohio Society in New York and its president for three years. 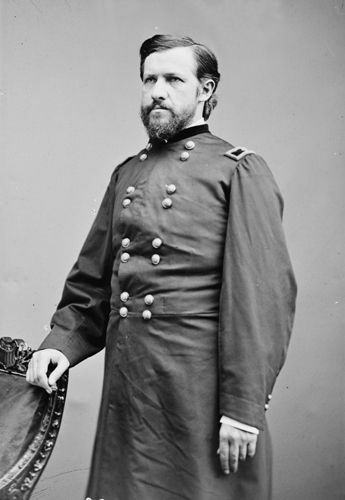 General Ewing died on January 21, 1896 after being hit by a street car. About the Article: The majority of this historic text was published in Kansas: A Cyclopedia of State History, Volume I; edited by Frank W. Blackmar, A.M. Ph. D.; Standard Publishing Company, Chicago, IL 1912. However, the text that appears on these page is not verbatim, as additions, updates, and editing have occurred.